We had a great time! We all loved talking to and spending time with the guest. She got along so well with my son, and we loved learning about her interests and family. The guest has been interested in different cultures since she was little and have always thought about studying abroad. 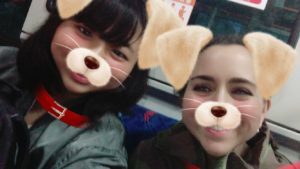 However, she doesn’t have confidence in her English level and she thought that study abroad is hard for her, even, short-term due to the household’s budget. She would like to participate and improve her English skills by joining the short term homestay program.